The endoplasmic reticulum (literally ‘inside plasma network’) is the major site of synthesis in the cell. It is a system of flattened sacs (cisternae) that extend from (and are continuous) with the outer nuclear envelope – taking up a significant volume of the cell (over half of the membranous components in the cell). Its physiological function has a very close association with that of the Golgi apparatus and together, they form the secretory pathway of the cell. 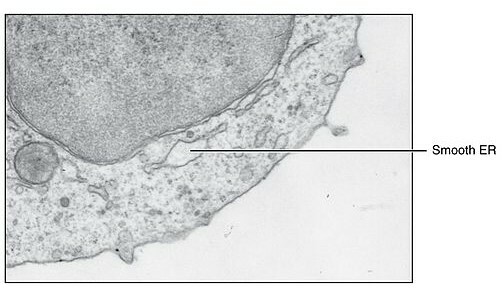 ‘Endoplasmic reticulum’ is classified as either rough or smooth, with minor variations in size (e.g. secretory cells in the GI tract) and function (e.g. sarcoplasmic reticulum in muscle) in specialised tissue. Ultimately, they differ ultra-structurally and this is the basis of their classification. All the mechanisms that are required for this to happen also take place in the RER – including initial stages of protein targeting, with the latter stages of protein targeting completed by the Golgi apparatus. Proteins destined for the cytosol are initially transcribed by free ribosomes suspended in the cytoplasm. Despite the presence of ribosomes being such a defining feature of RER, RER-ribosomal interactions are not permanent and thus go through periods of attachment and detachment depending on the demand for protein secretion. Adhesion to the surface is energy dependent and so we see ribosomes detach in hypoxic cell injury when ATP/GTP synthesis is reduced. Proteins that are translated into the lumen of the RER then undergo a series of post-translational modifications. Cells that produce many secretory proteins will have will extensive RER and mitochondria. mRNA is transcribed and exits the nucleus via the nuclear pores. They associate with free ribosomes in the cytoplasm. All proteins produced initially begin translation via ribosomes that are suspended free in the cytosol. What targets these proteins to the RER (and so secretion) is the intrinsic sequence of the mRNA that codes for the signal sequence. Once the signal sequence of the new (nascent) protein has been translated by the free ribosome (peptide-ribosome complex), another important protein recognises this and is responsible for guiding the complex to the RER, the signal recognising peptide (SRP). The SRP is also free in the cytoplasm. Binding of the SRP arrests translation. This is important as this serves a regulatory function. As there are only a discrete number binding sites for SRP on the RER, synthesis has to be controlled to prevent synthesis until their target location is ensured. This prevents excess proteins being synthesised entirely into the cytoplasm when all the binding sites are occupied. The peptide-ribosome bound SRP also binds to a molecule of GTP. This is the energy dependent component of ribosomal association with the RER. The GTP is important for the reactivation of synthesis. As discussed above, reduction of GTP supply prevents attachment of ribosomes and compromises the ability for secretory protein synthesis to occur as discussed above. GTP is synthesised from Succinyl-CoA via the TCA cycle. The GTP-SRP bound peptide-ribosome complex is then localised towards rough endoplasmic membrane where the SRP receptor (aka docking protein) is found. The SRP receptor is adjacent to a channel that allows the nascent protein to enter into the RER. This is the translocon. Binding of the SRP with the SRP receptor leads to GTP hydrolysis. The translocon is opened and SRP is dissociated. Synthesis of the nascent protein can continue into this translocon and therefore into the RER. If it is a secretory protein, movement of the protein into the RER is complete. In transmembrane proteins, their translation is arrested and a lateral gating mechanism releases protein out of the translocon into the membrane. As the signal sequence has already been translated, it enters the RER via the translocon first. An enzyme, the signal peptidase, cleaves the signal sequence and thus commits the protein to the secretory pathway. Once the whole protein enters the RER, modifications are made to it to ensure proper function and transport. Proteolytic cleavage (post translational modification by removal of inhibitory domains). Disulphide bond formation to ensure tertiary folding. Hydroxylation of amino acid resides (helps glycosylation). N- linked glycosylation – addition of carbohydrates onto Nitrogen residues. It is important to facilitate interactions with other molecules (e.g. cellular adhesion). Once the protein has been modified, it is pinched off within a vesicle and it moves towards the Golgi apparatus where it is further modified and packaged for targeting around the body. Proteins that are produced by free ribosomes are rarely glycosylated. The smooth endoplasmic reticulum is important in the synthesis of lipids, phospholipids and steroids. It is often less extensive and ribosomes do not associate with it, though certain specialised tissues (e.g. steroidogenic cells and muscles) often have extensive SER. They also contain cytochrome P450 enzymes which are important in the detoxication of certain drugs and toxins (xenobiotics) e.g. alcohol and barbiturates. Hepatocytes store glycogen in regions that are rich in SER. Smooth endoplasmic reticulum found within muscle is known as the sarcoplasmic reticulum and serves a specialised function. The SER in muscle is extensive because it plays a major part in the sequestration of calcium, which modulates the tonic force of contraction (and relaxation). The ultrastructure of the sarcoplasmic reticulum differs between muscle types. In striated muscle, they are arranged around the perpendicular T tubule, where the action potential/ surface Ca2+ inflow can initiate the calcium spike. This gives rise to the diads (cardiac muscle) and triads (skeletal muscle). Different types of muscles have different extensiveness of SR.
Further information on the role of the sarcoplasmic reticulum in muscle contraction can be found here. Malignant hyperthermia (MH) is an acute condition that arises as a result in the mutation of the ryanodine receptor of the sarcoplasmic reticulum in the muscle. The mutation leads to an increased sensitivity of the receptor to any potential agonist resulting in an exaggerated release of calcium resulting in what is known as a hypermetabolic crisis – a rapid acceleration of muscle metabolism with massive consumption of oxygen. The most common precipitating factor for MH is the use of volatile anaesthetic agents, such as succinylcholine. Muscle relaxants – dantrolene and discontinuation of the trigger are the treatments of choice. Dantrolene works by inhibiting release of Ca2+ from the SR.